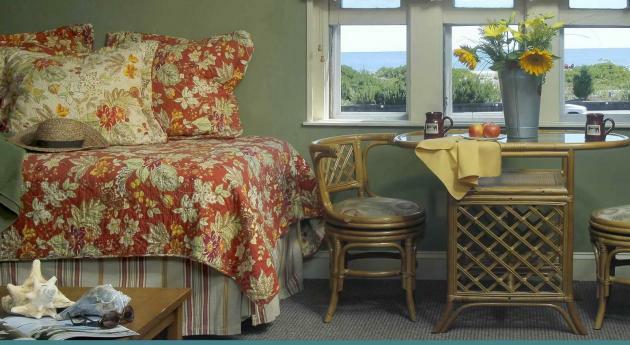 Our guest rooms evoke charm and serenity using calming natural colors. In keeping with the Arts and Crafts aesthetic of the Inn, all the rooms are decorated with the simplicity of the L. & J.G. 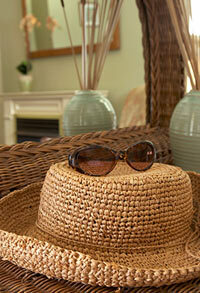 Stickley furniture line, wicker, and mission-style accessories. We provide you with silky soft micro fiber shawl robes, iron and board, hairdryer, pure essential oils bath products and daily housekeeping service. Satellite TV, iPod home clock radio, and WiFi are in every room as well. To start your morning right, a full hot breakfast is included with each day of your stay. 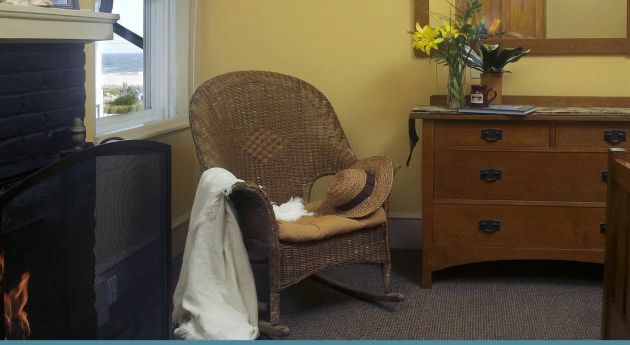 Our Cape Carriage House unit is our only pet friendly unit, and also the only unit that permits children under the age of 12 years. 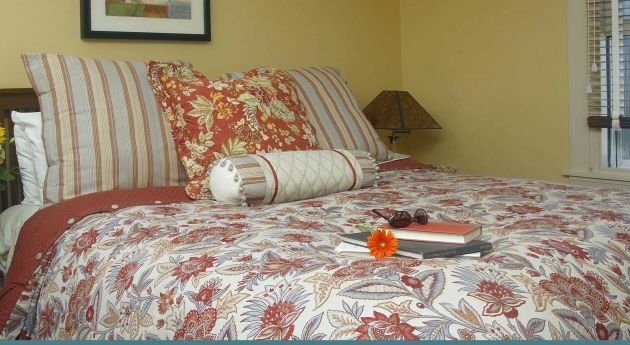 Our guest rooms are accented with your comfort in mind. Our beds are dressed for peaceful, sweet dreams on double pillow top mattresses, wrapped with luxuriously soft linens, decorative pillows and spreads from Eastern Accents bedding collection. 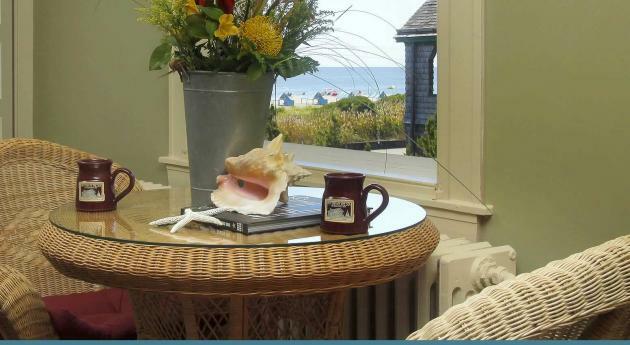 We have stayed in several B&Bs in Cape May through the years but we always keep coming back to Rhythm of the Sea. We were there this past weekend and as always our stay was perfect. The front porch overlooking the ocean is the best. The location couldn’t be better. The center of town is just a few blocks away but you miss all the hustle and bustle and searching for a parking spot. ACROSS THE STREET FROM THE BEACH! LOVED IT!! My husband and I did not want to leave! if we could have booked our whole stay here we would Have! Breakfast both days was Great! The Lobby is beautiful and the rest of the House is wonderful ! 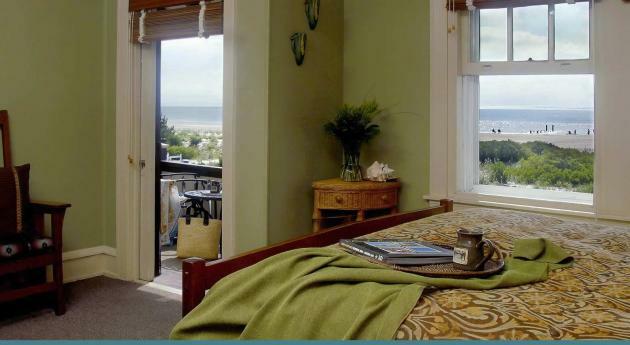 Both rooms we stayed in were clean , comfortable and had great ocean views! Afternoon snacks, drinks, beach chairs, towels , bikes & outdoor shower included. Cable tv and wifi great. LOVED the location, it was away from all the crowds, nice and quiet, but not too far away, so you could walk to the restaurants, shops, etc. Robyn the owner Was most welcoming , Friendly & Fun! She made us feel right at home! Misty the Inn keeper was wonderful ! Sweet, fun , and very accommodating! They gave 5 star service not only to us but from what I could see, all the guests! 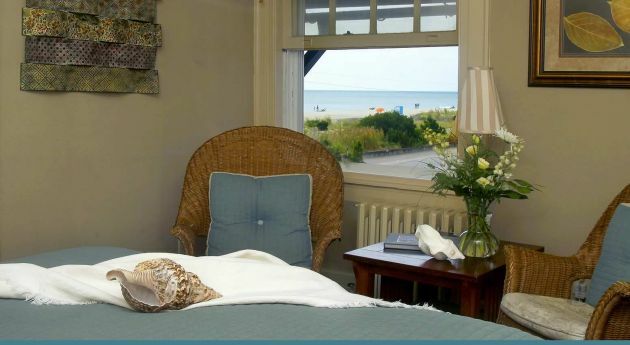 My husband and I stayed three nights in the Stone Harbor room (Room 5) and had a truly relaxing trip. The Inn is in the quiet part of town and the whole block is quiet and peaceful. I loved being so close to the beach and didn’t mind a walk towards town for meals. 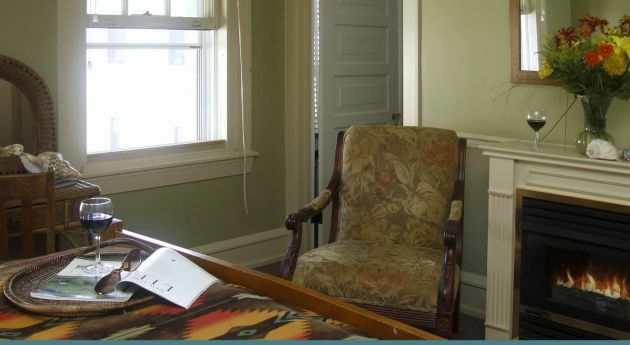 The bed was extremely comfortable, the bathroom was quite large, and the window AC worked like a charm. 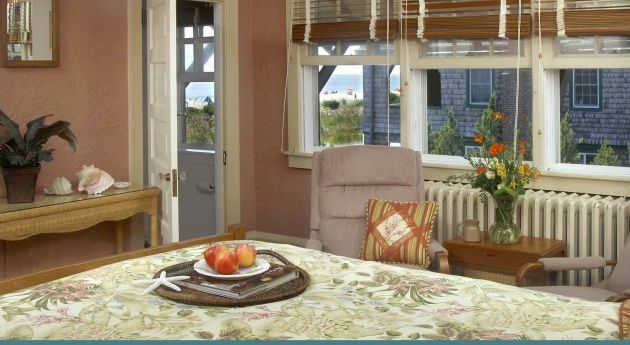 The vibe of the Inn is quiet and relaxed and it has many common areas to sit and relax. We enjoyed the rocking chairs on the front porch in particular but also found the chaise lounge a comfortable spot. Breakfast was delicious all three days and quite filling (omelets, granola parfaits, waffles, muffins) and afternoon treats were warm and tasty. I appreciated the iced tea and lemonade every afternoon too. Loved the basket of beach towels available for guests to use as well as the beach bikes and chairs. We only used the towels and bikes and while I admit the bikes could certainly use some air in the tires they were good enough for a quick ride to pick up lunch. I think we will be back in the future and are even considering a visit in the cooler months so we could try the in-room fireplace. What a lovely place! The beds were extremely comfortable–we shared the suite (room 8) which had two separate bedrooms and two bathrooms (one with shower) which suited us perfectly. I went with my aged parents, and Misty (the manageress) couldn’t have been more accommodating. My parents needed a mat for the bath and she went out and bought one for them. The “Arts & Crafts” inn is right on the waterfront with comfortable chairs to lounge in on the porch and a full sized pool table inside. Lemonade and baked snacks are served at 3:30, and the breakfasts were to die for–eggs benedict and homemade waffles with strawberries. Excellent coffee and juice. 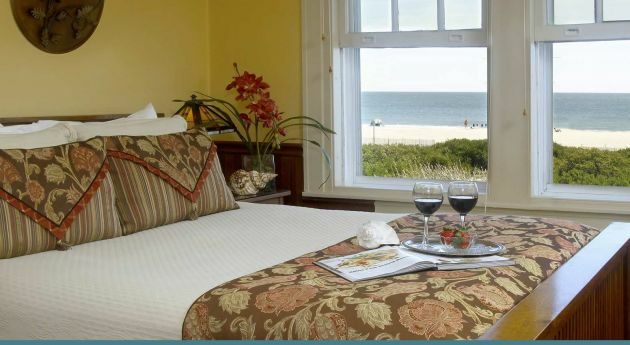 Just a perfect place for a memorable stay in Cape May.